Japanese-American Masao Abe received two Bronze Stars, a Purple Heart and a Congressional Gold Medal for his service in the U.S. Army. He died of natural causes in Issaquah, Washington on Aug. 6, 2013. Click here to read a brief synopsis of her fascinating story. Beautiful blonde actress Deborah Raffin became a philanthropic entrepreneur when after a very successful film career she and her husband began producing books-on-tape, which benefit greatly those who cannot see to read. An Associated Press obituary for Ms Raffin dated November 24th, 2012, details another of her charitable projects: "Ms. Raffin also compiled celebrities’ Christmas anecdotes for a 1990 book, “Sharing Christmas,” which raised money for groups serving the homeless. It included stories from Margaret Thatcher, Kermit the Frog and Mother Teresa." In the mid-1970s, I was on-set with Deborah Raffin and Edward Albert Jr., appearing in one scene at a big band dining-and-dancing venue. Edward Albert came to my table and asked me for "a match", whereupon I lit his cigarette. 1930s clothing and music are fabulous; there was a live, professional swing band, so I had a blast. Deborah Raffin was elegant and lovely, a shining example of womanhood who made the world a better place for the disadvantaged. passed away from cancer on November 22nd, 2012. The prolific writer and former New York advertising executive's book is an epic story of youthful survival, set in South Africa where Mr Courtenay was born and raised. JacquesBarzun, the pioneering cultural historian who became a best-selling author in his 90s with "From Dawn to Decadence," has died. He was 104. Barzun's son-in-law says Barzun passed away Thursday, Oct. 25, 2012, in San Antonio, where he'd lived in recent years. Barzun wrote dozens of books and essays on everything from philosophy and music to detective novels. Dignified and elegant, actress Tippi Hedren was born Nathalie Kay Hedren in Minnesota to Swedish and Norwegian parents; they moved to California when she was in her teens. Tippi, whose nickname was bestowed upon her as a baby by her father, then became a model and moved to Manhattan, where she appeared in a Sego diet-drink television commercial, causing director Alfred Hitchcock to flip over her beauty and refined bearing. Shortly thereafter, Tippi Hedren starred in the most popular Hitchcock film, The Birds, and a cult classic, the psychological drama Marnie, also directed by Alfred Hitchcock. Miss Hedren, born in 1930 and still working, is an active supporter of horses, pets and wildlife in general. She is also a philanthropist. In a Los Angeles Times article and in a televised CBC news-story, Tippi Hedren was described as being a pivotal figure in the modern development of Vietnamese-owned nail salons in the United States, a phenomenon that spread rapidly in New York City and Canada. Drawn to the plight of refugees from the Vietnam War, she began visiting a tent city named Hope Village. In 1975, Miss Hedren helped scores of female Vietnamese immigrants by having her manicurist teach them the skills of the trade and working with a local beauty school, helping the to find these women jobs. In Canada, the nail-parlour industry is now dominated by Vietnamese immigrants and refugees. Adding to that legacy, many of today's actresses proudly emulate Tippi Hedren's timeless, classic style of dressing and her sophisticated manners. Born in Livermore, Maine, U.S.A., Benjamin Washburne served the congressional district that included his home-town, Galena, Illinois as an early member of the Republicans in the House of Representatives, and was a leader of the Radical Republicans. Washburne was among the original promoters of legal racial equality. As a congressman, he served on the Joint Committee on Reconstruction which drafted the Fourteenth Amendment to the United States Constitution. After the Civil War, Elihu Washburne advocated that large plantations be divided up to provide compensatory property for freed slaves. Washburne served as President Ulysses S. Grant's Secretary of State, replacing William H. Seward. He became ill and served for only twelve days in March 1869; it remains the shortest term of any Secretary of State. President Grant sent Mr. Washburne to France as head of the U.S. diplomatic mission. He was the only diplomat from a major power to stay in Paris during the Franco-Prussian War, and played a heroic role in providing both diplomatic and humanitarian support during the Siege of Paris and, after the war, the bloody civil war which was instigated by the Paris Commune. Though his life was in danger, The Hon. Elihu Washburne stayed in Paris during the Franco-Prussian War and was the man who singlehandedly ferried thousands of Germans and Americans to safety. He freed thousands of women prisoners of war whose only "crime" was that they had originally come to France from Germany. Thousands of the U.S. ex-pat community in Paris owed their lives to Elihu Washburne, U.S. Foreign Minister to France. Elihu Benjamin Washburne wrote accounts daily of the occurrences in France during both the Siege of Paris and the war that immediately followed it, known as the Paris Commune. He is distinguished among journal-keepers for his vivid and accurate descriptions, always faithful in his self-imposed duty to record historical events, though his personal situation was grave and he was working tirelessly to save lives. Washburne retired from government in 1876, although, being extremely popular as a humanitarian hero, he was considered as a presidential candidate at the Republican conventions in 1880 and 1884. He moved to Chicago, Illinois, and served as president of the Chicago Historical Society from 1884 to 1887. Elihu Washburne passed away on October 23, 1887. Award-winning author, David McCullough, writes about Elihu Washburne and other famous Americans in Paris in his 2011 book, The Greater Journey, which I have read and highly recommend. The soldiers, of course, wanted nothing to do with the dog and the barking covered the inevitable noises made by these children and babies. in a glass jar that she buried under a tree in her garden. After the war, she tried to locate any parents that may have survived, in an effort to reunite the families. Most had been gassed. The children whom she helped got placed into foster family homes or adopted. In 2007 Irena was nominated for the Nobel Peace Prize. She was not selected. There is little justice in this world, but a young Catholic woman risked her life during Hitler's murderous, tyrannical regime to save many Jewish children; Irena Sendler believed in fighting for their freedom and right to exist. Prince Philip of Great Britain has just turned ninety, and an additional title has been bestowed upon him by his wife, Her Royal Highness Queen Elizabeth II to mark the occasion: Lord High Admiral of the British Royal Navy. Sadako Moriguchi co-founded the Asian grocery and gift market, Uwajimaya, in Seattle. She and her husband Fujimatsu Moriguchi (1898-1962) started a small grocery, which they called Uwajimaya, when they returned to Seattle after World War II. They had spent the war years in the Tule Lake Relocation Camp in California. From frugal beginnings, Uwajimaya, located in Seattle's International District, is now the largest Asian grocery and gift market in the Pacific Northwest. She was the sister of the renowned sculptor and fountain maker George Tsutakawa (1910-1997). Sadako Tsutakawa was born in Seattle on October 16, 1907. At the age of 5 she was sent to Japan to receive a traditional education. She returned to Seattle in her early 20s. According to family lore, her father, who was an import/export merchant in Seattle, arranged her marriage with his business associate, Fujimatsu Moriguchi. Moriguchi owned a truck and delivered tofu and soy sauce to Japanese laborers in logging and fishing camps in the Pacific Northwest. He called his business Uwajima-ya, after his birthplace in Japan. Ya means store in Japanese. The Moriguchis were forced into an internment camp along with other Japanese Americans at the beginning of World War II. They spent the war in the Tule Lake Internment Camp in northern California, and Sadako Moriguchi had three of her seven children there. They returned to Seattle after the war. The Japanese community had been shattered and there remained widespread racism against persons of Japanese descent. In these difficult times, the couple managed to buy a small building on south Main Street in Seattle's International District. This was the beginning of Uwajimaya. The store expanded and opened a gift shop at the Seattle's World's Fair in 1962. The shop thrived. That summer though, Fujimatsu Moriguchi passed away. He had left the store to his four sons (breaking with the Japanese tradition of leaving the business to the eldest son). The sons subsequently divided ownership with their three sisters and their mother, Sadako. Sadako Moriguchi worked in the store until she was 85. She made rice balls and sushi, and served the staff lunch every day, as is traditional for restaurant owners in Japan. All of the children worked in the store. Though she never had an official position in the company, her son, Tomio Moriguchi, said that the family credited her with keeping the family together in her own quiet way. On July 25, 2002, Sadako died from complications of Alzheimer's. M-J's note: Mrs. Moriguchi is my step-sister, Lena Sadako Moriguchi's beloved grandmother. She was a perennial subscriber to the Seattle Symphony Orchestra, which I was fortunate enough to attend with her. What an accomplished woman Sadako Tsutakawa Moriguchi was. "I was able to help those people. They were powerless, and they didn’t know where to turn. I always emphasize that we weren’t heroes. We simply did our duty as human beings: helping others who were in need. A lot of people didn’t do that in those times: some out of fear. If someone is afraid then you can hardly blame them. If they can honestly admit that, as a friend of mine did back then, then I think that’s brave." Read about Miep Gies in the Telegraph U.K.
Freddy Bloom, who has died aged 86, was a New Yorker who, after a searing three and a half years in Japanese prison camps during the second world war, made her home in London. The mother of a daughter born profoundly deaf, she subsequently devoted her life to the needs of deaf children. She was born Elfrieden Wenzel, the only child of Robert, a German consular official, and his wife Emmy, a journalist. She graduated from Barnard College of Columbia University, New York, and took a further degree at Trinity College, Dublin, after her parents moved to Ireland. Her first marriage was to a medical student who became the medical officer to a regiment of the Indian army. When war broke out, her husband was posted to Malaya where, almost immediately, he contracted pleurisy and died. Freddy found a job as a journalist in Shanghai and, while living there, met Philip Bloom, then a major in the Royal Army Medical Corps. Nine days after they married, Singapore fell, and Freddy and her husband were interned in different Japanese camps. It was an ordeal from which many failed to emerge and in which a few displayed immense heroism. Freddy was one of the latter; she was indomitable and raised the morale of her fellow prisoners through a camp newsletter, called Pow Wow, which she started. That was to lead to the most agonising experience of her incarceration. Because of her editorship of the publication, she was suspected by the Japanese of involvement in a spy ring. She was removed from the women's camp for interrogation, and held for five months, from October 1943, in a Singapore prison. There she shared a cell 17 feet by 10 feet with 15 men. All were forced to sit crossed legged throughout the day and at night were permitted to lie down on the floor. There was no furniture and a single lavatory was the only source of water. Released because of a near-fatal illness, Freddy was returned to the Changi women's camp, where she remained until the Japanese defeat. Despite the unspeakable privations she had endured, Freddy never expressed, nor appeared to harbour, any bitterness towards the Japanese people, and, in 1994, accepted an invitation to visit that country. She regarded it as an occasion for reconciliation and for establishing personal relationships with a number of Japanese. After their release in 1945, husband and wife, with little but what they stood up in, came to London, where Philip set up a consultancy practice as an obstetrician and, later, a psychiatrist. Freddy, incapable of sitting still, ran the Youth Book Club, a non-profit enterprise to encourage teenagers to read good literature. That occupation was interrupted the following year when her daughter Virginia (Ginny) was born. Because of the malnutrition Freddy had suffered in the Japanese camp, Ginny was born profoundly deaf. At the time, children in that condition were regularly described as "deaf and dumb", but Freddy was determined to change that concept. It was a decision which transformed her own life and benefited thousands who were born with the disability. Freddy dedicated herself to teaching Ginny how to speak, and her unstinting devotion of time, effort and patience was rewarded. Ginny is so articulate that it is almost impossible to believe that she cannot hear. Freddy brought her experience and determination to a small society concerned with deaf children which she expanded into the National Deaf Children's Society (NDCS), of which she was chairman until 1965 and vice-president until her death. She devoted herself unstintingly to this organisation - lecturing, broadcasting, advising and editing its magazine. It was entirely through her efforts that the NDCS received national and subsequently international recognition. For her services to deaf children, she was awarded an OBE in 1966. During her internment, Freddy had both kept her own sanity and preserved a record of events by writing frequent letters to Philip which, however, she could never send. In 1980, these letters of understated horrors and experiences were published under the title of Dear Philip: a diary of captivity, Changi 1942-5. Most of her other published works, like Our Deaf Children (1963), offered help and advice to parents. Until the very last, Freddy retained her inquiring mind, dauntless spirit and an infectious humour. She never asked for sympathy and one of her constant refrains was: "Who said life has to be fair?" She was at her most relaxed with a cigarette in one hand and a glass in the other. Straightforward and a ready and patient listener, Freddy was one of those spirits who instantly inspired trust and affection. She leaves Ginny, and a son, William, as well as a host of friends whose lives she enriched. Her husband died in 1984. Oscar-winning actress and major patroness of fine art Jennifer Jones died at her home in Malibu, California on December 19th, 2009, at the age of 90. 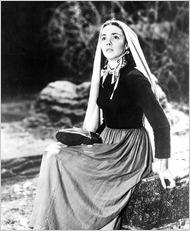 She achieved Hollywood stardom in the 1943 movie “The Song of Bernadette” and other films of the 1940s and ’50s. 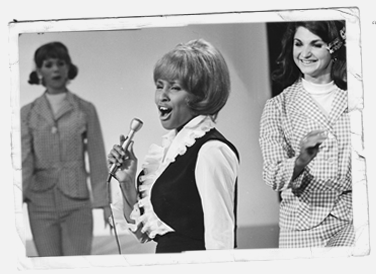 Miss Jones also gained much attention for a glamourous and accomplished personal life. She was a breast cancer survivor. Jennifer Jones Simon, who was long-time chairwoman of the Norton Simon Museum of Art in Pasadena, died of natural causes, said Leslie Denk, a museum spokeswoman. Ms. Jones was the widow of the industrialist and art patron Norton Simon. Jennifer Jones was married to David O. Selznick from 1949 until his death in 1965. After winning an Academy Award in 1944 for her performance in “The Song of Bernadette,” Ms. Jones went on to star in successful films, including “Duel in the Sun” and “Love Is a Many-Splendored Thing.” She was nominated for Oscars five times. Her ethereal appearance in "Portrait of Jennifer" inspired industrialist and art-collector Norton Simon to purchase the painting of her which was created for the film, and the two were married from 1971 until his passing in 1993. Henry Allingham, the world's oldest man and the oldest surviving British veteran from World War I, has died at the age of 113. Mr. Allingham died in his sleep at St. Dunstan's care-home in Ovingdean, England. Born on June 6, 1896, Allingham was active until his final days, having celebrated his 113th birthday last month on the HMS President with his family. The Guinness Book of World Records Certified Allingham as the world's oldest man in June of 2009. "The queen was saddened to hear of the death of Henry Allingham. He was one of the unique generation who sacrificed so much for us all. Our thoughts are with his family at this time," Buckingham Palace declared. "I had the privilege of meeting Henry many times," said Prime Minister Gordon Brown. "He was a tremendous character, one of the last representatives of a generation of tremendous characters. My thoughts are with his family as they mourn his passing but celebrate his life." The Battle of Jutland holds the all-time record for the most gun-armed battleships and battlecruisers engaged in a fight, according to Britain's Ministry of Defence. Allingham was a founding member of today's Royal Air Force, which was formed in 1918 when the Royal Naval Air Service merged with the Royal Flying Corps. "Henry was always determined to ensure that today's generation does not forget the sacrifice of those who died on the Western Front," a representative of St. Dunstan's nursing home said in a statement after Allingham's passing. "Until recently, he regularly visited schools and attended war-based events as an ambassador for his generation." Asked once at a memorial ceremony how he would like to be remembered, Henry Allingham demurred, saying that people should instead remember those who died in the wars. "Remember them, not me," he said. He was installed as a chevalier in France's Legion of Honor in 2003 and was promoted to officer of the institution earlier this year. Awarding the honor, the French ambassador to Britain thanked Mr. Allingham, on behalf of French President Nicolas Sarkozy, for his work in protecting France during the two World Wars. The Royal Navy celebrated Henry Allingham's birthday last month by throwing him a party aboard the HMS President. A birthday cake and card signed by the First Sea Lord were delivered by fast-raiding craft of the Royal Marines; Mr. Allingham was given a decanter of Pusser’s Rum, his "favorite tipple," by the Fleet Air Arm. Henry Allingham's wife, Dorothy, died in 1970. Their two daughters both died in their 80s. He is survived by six grandchildren, 16 great-grandchildren, 21 great-great-grandchildren, and one great-great-great grandchild, all of whom live in the United States, said a representative of St. Dunstan’s at Ovingdean. Since 2006, Henry Allingham had lived at St. Dunstan's, a nursing-home for blind ex-military people on the south coast of England. He had lost his sight as a result of age-related macular degeneration. "Everybody at St. Dunstan's is saddened by losing Henry, and our sympathy goes out to his family," said Robert Leader, chief executive at the home. "As well as possessing a great spirit of fun, he represented the last of a generation who gave a very great deal for us. Henry made many friends among the residents and staff at the home. He was a great character and will be missed." LOS ANGELES – The Honorable Leonore Annenberg, a major patron of the arts and education and the billionaire widow of publishing magnate and Ambassador to the Court of St. James Walter Annenberg, has died at age 91. 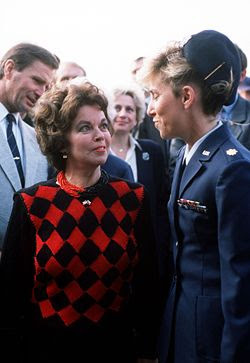 Mrs. Annenberg, who served briefly as President Ronald Reagan’s chief of protocol, died early on March 12th, 2009, of natural causes at Eisenhower Medical Center in Rancho Mirage, said Kathleen Hall Jamieson, an Annenberg family spokeswoman and director of the Annenberg Public Policy Center at the University of Pennsylvania. When Ronald Reagan appointed Mrs. Annenberg to the protocol post in 1981, it was as if she had spent her first 63 years preparing for a role in which attention to etiquette and diplomatic detail play such an important part. What she called her only other “meaningful job” didn’t come with a salary but took her to London, where Mr. Annenberg served as U.S. ambassador to Britain from 1969 to 1974. She delighted in mingling with the royal family, entertaining and refurbishing the ambassador’s mansion. Mrs. Annenberg became an equal partner in the family’s charitable legacy over the course of her long marriage and assumed control of the Annenberg Foundation upon the death of her husband in October 2002. Since its creation in 1989, the foundation has given away $4.2 billion to cultural, educational and medical institutions. Mr. Annenberg owned a communications empire that included TV Guide. In 1988 he sold his Triangle publishing company to Rupert Murdoch for $3 billion. The Annenbergs endowed schools of communication at the University of Pennsylvania and the University of Southern California. In the early 1950s, the Annenbergs began building a renowned collection of impressionist and post-impressionist masterpieces that was worth an estimated $1 billion when they pledged it to the Metropolitan Museum of Art in 1991. During her lifetime, Mrs. Annenberg sat on the boards of the nation’s most prestigious philanthropies devoted to the arts and education. In addition to her daughters, Diane Deshong of Beverly Hills and Elizabeth Kabler of New York, and stepdaughter Wallis Annenberg of Los Angeles, Mrs. Annenberg is survived by a sister, seven grandchildren and seven great-grandchildren. In her capacity as chairman and president of the Annenberg Foundation after her husband Walter’s death in 2002, Leonore Annenberg, known as Lee, gave away billions of dollars to cultural and medical institutions. While in London in the early 1970s, Walter and Mrs. Annenberg were generous benefactors – notably to the British Museum, St Paul’s Cathedral and Westminster Abbey. Lee Annenberg founded the American Friends of Covent Garden in London. As a couple, his frankness and her grace complemented each other, and Lord Charteris recalled: “He was honourable and straightforward, and Lee was such a splendid character, that before very long he was the most respected Ambassador at the Court of St James.” But though born to wealth, Lee Annenberg was not always blessed with happiness. She was born Leonore Cohn in New York on February 20 1918, the elder daughter of Max Cohn, a textile merchant whose business was failing, and of Clara Henle, his wife, whose family had emigrated from Berlin. Lee was the niece of Harry Cohn, founder of Columbia Pictures, who brought her up from the aged of 11 onwards – her mother having died when Lee was seven, leaving her father unable to cope. Harry Cohn was one of the legendary Hollywood producers. Lee Annenberg went to school in Pasadena and traveled through Europe with her sister. Soon after graduating from Stanford University in 1940, and in the teeth of opposition from Harry Cohn, she married her first husband, Belden Katleman, from a family in real estate who owned a national chain of parking lots. He was reputed to have had mob ties in Las Vegas. Their marriage, which produced a daughter, dissolved in 1946. Subsequently, Lee married Lewis Rosenstiel, a multi-millionaire three decades her elder who had founded the Schenley liquor distillery (the second largest in the United States after Seagram). She moved into his 1,500-acre estate at Greenwich, Connecticut, and gave birth to a second daughter. But the marriage ended in a bitter divorce, Lee citing extreme mental cruelty and leaving the marital home with only the clothes she was wearing. They soon owned Van Goghs and Monets, and became prominent socially. They lived on an estate in Pennsylvania, and owned a 400-acre winter estate, Sunnylands, at Rancho Mirage, near Palm Springs. It became a retreat for the rich and famous. When he saw it, the Prince of Wales said: “You gave up this to come to London?” The Reagans, Frank Sinatra and Bob Hope also came to visit. Ex-President Nixon headed there after his resignation in 1974. There was also a ski lodge in Sun Valley and a magnificent apartment in New York. In 1969, after Nixon became President, he appointed Walter Annenberg US Ambassador to Britain. Lee set about renovating the Ambassador’s residence, Winfield House in Regent’s Park, spending $5 million on it in six months, and filling it with post-Impressionist paintings. The Annenbergs were great supporters of Ronald Reagan, and it was Walter who helped forge his friendship with Margaret Thatcher. 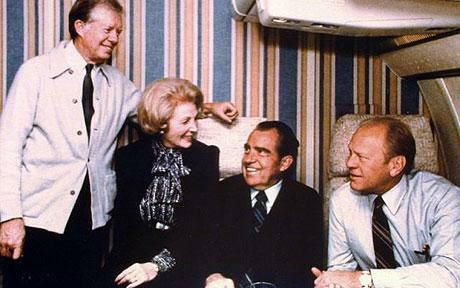 They supported President Reagan’s 1980 presidential campaign, and after his election Reagan appointed Mrs. Annenberg chief of protocol of the United States (with ambassadorial status), in which role she advised the president and others and formally welcomed foreign dignitaries on their arrival in America. Following a dispute over who should organize the presidential attendance at Anwar Sadat’s funeral, Mrs. Annenberg resigned her post as U.S. Chief of Protocol in order to spend more time with her family. For the rest of their lives, the Annenbergs were philanthropists supporting numerous worthy causes. In 1989 Walter founded the Annenberg Foundation, which created the Annenberg Challenge, a $500 million contribution to a five-year program of educational reform. The Annenberg Foundation has now given away some $4.2 billion, and after Walter Annenberg’s death at the age of 94, Lee succeeded him as chairman and president. Leonore Annenberg was a trustee of the Metropolitan Museum of Art, on the board of trustees of the Philadelphia Museum of Art, and a managing director of Metropolitan Opera. She was also associated with numerous similar enterprises, such as the University of Pennsylvania, the Richard Nixon Library, and the Royal Academy in England. In 2001, Mrs. Annenberg was awarded the Andrew Carnegie Medal of Philanthropy. Mrs. Annenberg entertained the Queen and the Prince of Wales at her home, and in 2007 she attended President Bush’s dinner for the Queen in Washington. In 2004 she was awarded an honorary CBE (Commander of the British Empire). A kind and gentle woman, it was said that her porcelain skin was never touched by the sun and that she wore “a meringue of blonde hair impervious to the elements”. She was never known to “dress down”. The brilliant, amusing journalist and English pundit Edwin Newman passed away on September 13th in Oxford, England at the age of 91. Every time I saw his books in our home library, I prayed to God that the author was doing all right and enjoying life. 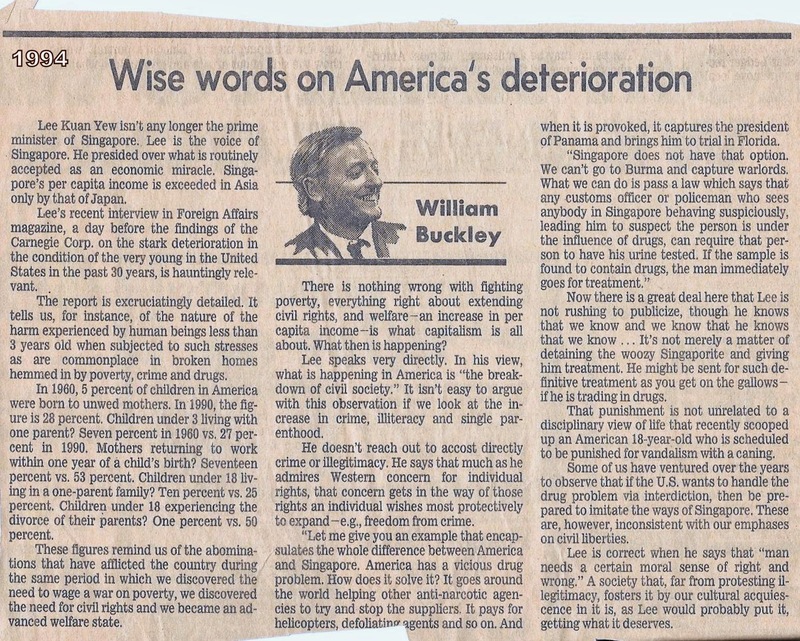 Mr. Newman was our keynote speaker at the English-Speaking Union World Conference in Princeton circa 1997. There, I took photos of the great television newsman speaking, and had him sign my copy of "I Must Say." I read his hilarious, incisive book, "Strictly Speaking," on an airplane when I was seventeen, which taught me much and enhanced my love of the language. Thank you, Edwin Newman! Former First Lady Nancy Reagan has been privately lobbying in favor of federal financing of embryonic stem-cell research for many years. 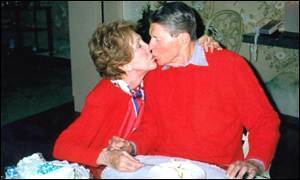 Mrs Reagan is said to believe that the research could lead to a cure for Alzheimer's disease, which afflicted her late husband, President Ronald Reagan. "It's lonely, because... there's nothing that anybody can do for you," she told CBS News in 2002. Republican Senator Arlen Specter told the New York Times that Mrs Reagan had been "very helpful" in raising awareness of the issue of stem cell research. "She's a former first lady, she holds a special position because of her own persuasive personality, and her husband, President Reagan, has Alzheimer's... she's a triple threat." Supporters believe that federally-funded stem-cell research could be valuable in curing or alleviating chronic and degenerative conditions such as diabetes, Parkinson's disease and spinal cord injuries. These are people who have had serious, seemingly insurmountable bumps in the road of life, but persevered to ultimately achieve success. I also include people who have lived very long, successful lives. Some Elegant Survivors have had near-death experiences and experienced great hardships, while others have managed extraordinary, very long existences. 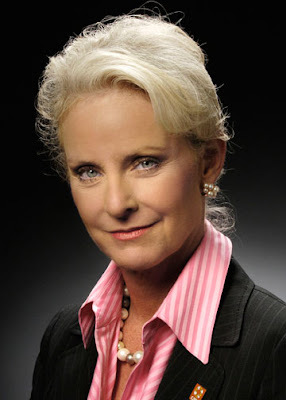 Arizona native (May 20th, 1954) Cindy McCain is the wife of Senator John McCain. An advocate for children's health care needs, she founded the American Voluntary Medical Team in 1988, and led many medical missions to developing and war-torn countries during the Team's seven-year existence. Mrs. McCain visited Rwanda in 1994, during the bloodiest period of the Tutsi and Hutu conflict, the genocide which President Clinton virtually ignored. In 2000, Cindy was instrumental in her husband's notable run for President of the United States. That year, she was chosen to represent the State of Arizona at the Republican National Convention as the Chairwoman of the Arizona Delegation. She serves on the Board of Operation Smile and the Halo Trust, as well as several local organizations. Mrs. McCain has a Master's degree in Special Education from the University of Southern California. A survivor of severe physical ailments and spinal surgery, she is also recovered from a resultant addiction to pain medication. Mrs. McCain is candid about the subject, and encourages awareness of the problem in the spirit of prevention. Released by a British division of Random House on January 3rd, 2008: a woman's gripping story of escape from Vietnam, and her amazing survival when all around her death and chaos reigned. My friend, Juliet Lac has written an autobiography entitled, War Child. Juliet, a long-time resident of California and Paris, France, is the author of a popular ex-patriate website, Paris Woman. Juliet's book takes you along on her journey from Vietnam to an ultimately successful life in the west. Her interpretations and analyses of prejudices that she experiences are insightful and very personal, while giving us a bird's eye view of the human condition in general. Despite many hardships, Juliet develops the determination and personal power to surmount all obstacles in her path. Juliet Lac is a true American. A new, American edition version of her autobiographical book will make its debut in spring, 2009, by Citadel Press: Blossoms on the Wind, by Juliet Lac. funniest women of all time! Happy 80th birthday, Shirley Temple Black! 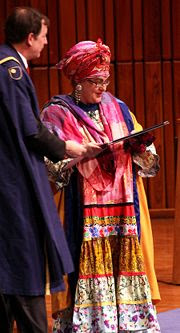 Camila Batmanghelidjh, founder of Kids Company charity in Great Britain, knows what it means to be a survivor. She is helping young people in London to overcome conditions at home that lead to violence and disaster. Having had a childhood of privilege, Camila Batmangelidjh's life changed drastically for the worse during and after the Iranian revolution in the 1970s. After personal hardship and tragedy, she pulled up her socks and became an award-winning psychologist and philanthropist. Read a piece on this gracious woman in the BBC News. During the 1980s, my husband did some charity work in Manhattan. He accompanied the late philanthropist Brooke Astor on her visits to charity offices in drug-infested, poor sections of the city. When asked by someone why she went there dripping with jewels and swathed in fur (it wasn't my husband who asked--he always appeared with jacket and tie, hat and walking stick), Mrs. Astor replied that the people would be disappointed if she didn't. She was a lady who understood people, having grown up around the world as the daughter of a military official; and while devoting her life to helping others, Brooke Astor was true to herself. We frequently report on the Queen of Jordan’s benevolent activities. 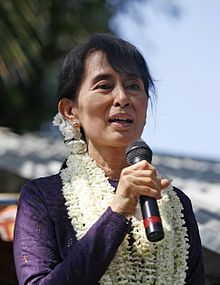 This courageous woman has a web-site wherein she invites comments on her speeches, which she presents there via youtube. This is very risky, given the worldwide breakdown of common courtesy. Still, Her Majesty believes that it is worth the gamble nonetheless, for the sake of her diplomatic causes. Queen Rania al Abdullah is on a mission to create and promote cross-cultural understanding. In January's special edition of The Economist (The World in 2009), Her Majesty Queen Rania al Abdullah writes about the importance of educational advances in Jordan and other Muslim countries. Here is the latest from Queen Rania al Abdullah of Jordan. M-J's hand-picked books on Amazon.com represent many of the distinguished Elegant Survivors on this page. The great Hungarian-born British food critic passed away in June, 2010 at age 94.